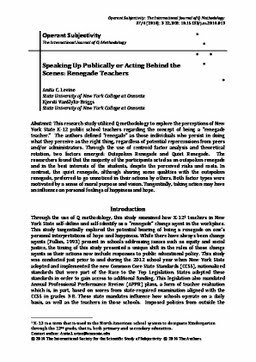 This research study utilized Q methodology to explore the perceptions of New York State K-12 public school teachers regarding the concept of being a “renegade teacher.” The authors defined “renegade” as those individuals who persist in doing what they perceive as the right thing, regardless of potential repercussions from peers and/or administrators. Through the use of centroid factor analysis and theoretical rotation, two factors emerged: Outspoken Renegade and Quiet Renegade. The researchers found that the majority of the participants acted as an outspoken renegade and in the best interests of the students, despite the perceived risks and costs. In contrast, the quiet renegade, although sharing some qualities with the outspoken renegade, preferred to go unnoticed in their actions by others. Both factor types were motivated by a sense of moral purpose and vision. Tangentially, taking action may have an influence on personal feelings of happiness and hope.